If woodblock prints are to be believed, the metropolis was once awash in greens and blues. Reedy riverbanks, grassy hillocks and marshes draped with willows all feature in “One Hundred Famous Views of Edo,” the 19th-century series of woodblock prints of the capital (then called Edo) by master artist Utagawa Hiroshige. Above all are the waterways, wide rivers and narrow canals colored a deep Prussian blue, crisscrossed by gently arching wooden bridges. Boats — cargo boats, piled high with barrels and steered by stooped men in sampans; pleasure boats, their blinds drawn on the courtesans and patrons within — make their way up and down these causeways. One hundred and fifty years ago, Tokyo, at least from the right angles, looked downright romantic. So the question is: What happened? I’m standing with Norihisa Minagawa at the entrance to a shōtengai, a shopping street the likes of which can be found in neighborhoods all over Japan. This one happens to be in the Wakaba district of Shinjuku Ward. Like most shōtengai, it contains the smallest of small businesses, including a broom closet-sized electronics store manned by an elderly man wearing a baseball cap and watching television. The street is narrow and oddly crooked. With its faded signs, it looks inconsequential. But it isn’t; it’s a clue. Stick with me, we’re going for a walk. 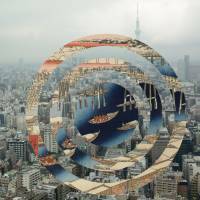 Minagawa is an architect by trade. 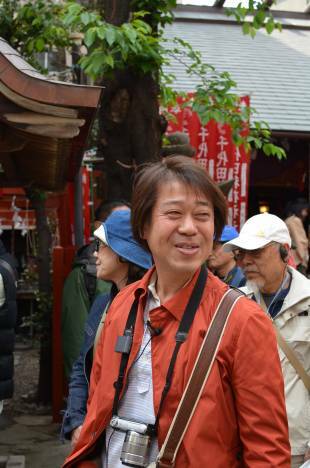 He is also the founder, along with his colleague, Hajime Ishikawa, of the amusingly named Suribachi Gakkai (Mortar Society), a loose collective of amateur historians and machi-aruki (city walking) enthusiasts. They’re part of a long tradition of urban explorers that, in Japan, would include anyone from the sentimental early 20th-century novelist Nagai Kafu to the scholar Hidenobu Jinnai, author of the excellent “Tokyo: A Spatial Anthology,” to the Street Observation Studies Society of the 1980s, whose particular mania were the uncanny oddities that Tokyo is apt at producing (decorative stairways to nowhere, for example). For them, and for Minagawa, walking is the key to understanding Tokyo, it’s particular Tokyo-ness and how it got to be that way. “People know that there are a lot of hills (in Tokyo). But people don’t really walk, they take the subway. So you come out of the subway, and you don’t know what’s beyond the hill. But if you walk around on the surface you can really see the unevenness,” Minagawa says. 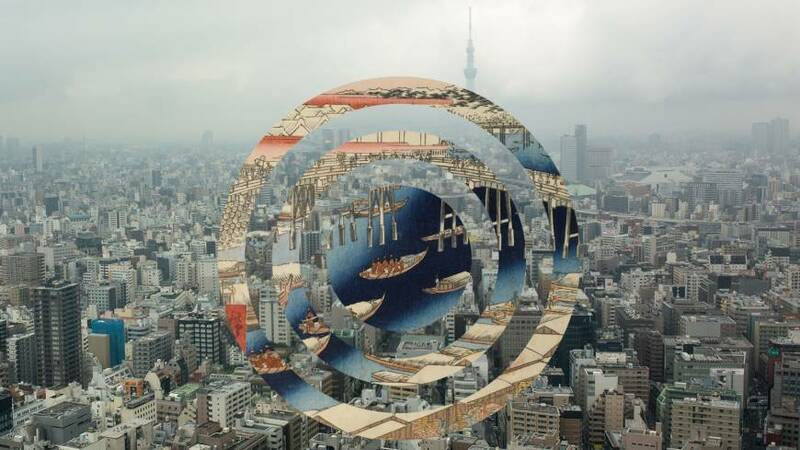 Suribachi Gakkai’s singular focus is Tokyo’s natural topography. With a far from ironic seriousness, they spend weekend afternoons charting the city’s hills and valleys. It’s an endeavor that involves some serious legwork, as Tokyo, which I have quickly come to understand, has a lot of literal ups and downs. Geographically, Tokyo is often divided into shitamachi, the lowlands of the east side of the city, and yamanote, the highlands to the west. 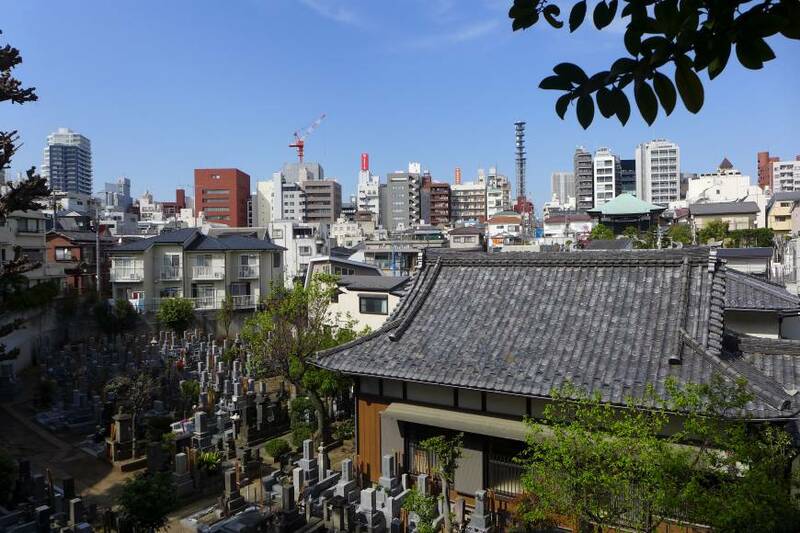 Historically, during the feudal Edo Period (1603-1868), yamanote was the district where the lords had their villas. Meanwhile, shitamachi was the district of the common people. If you look at a topographical map of Tokyo, you can see that the divide falls on a fairly straight line drawn from Ueno to Meguro, where the Musashino Plateau gives way to the Sumida River delta. The Imperial Palace, on the grounds of what used to be Edo Castle, sits just on the edge of the highlands, with a commanding view over the lowlands and Tokyo Bay. 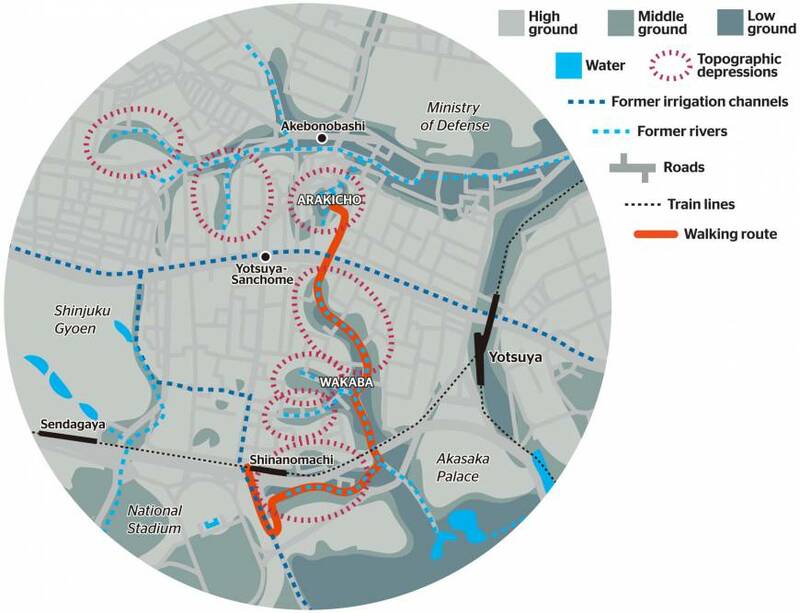 Yet a closer look at the topography of the yamanote turns up a more complicated picture: The yamanote itself is perforated by rivers that run toward the bay and rivulets that end in swamps and pools. The result is an undulating unevenness, a series of hills and valleys. It’s a topography that sets Tokyo apart from other Japanese cities, and most cities in general. The day I meet Minagawa, he is leading a group of 20 or so members of the NHK culture club — a sprawling organization that offers courses and seminars on diverse themes — around the eastern side of Shinjuku Ward, from Shinanomachi Station to Akebonobashi Station. This wasn’t an official outing of the Suribachi Gakkai, more like a lesson for the uninitiated on reading Tokyo like a palimpsest. (Or a neighborhood stroll with that friend who knows all the best detours, and the stories they hold). Minagawa hands out photocopies of maps of our route, one each from the Edo, Meiji (1868-1912) and present eras. Looking very much the student of the streets that he is — wearing jeans, a windbreaker and sneakers, and carrying a canvas satchel bag — Minagawa sets a quick pace. He leads the group southeast along Gaien Higashi Boulevard, which runs along the forested grounds of the Meiji Gaien complex, with its sports stadiums and halls. This is followed by an abrupt hairpin turn to the left and a steep descent. Unlike the broad, regal sweep of the boulevard, which was now several meters above our heads, the roads in the valley below are narrow and tightly woven. We’d left behind establishment Tokyo for a residential quarter, a warren of two-story, wood-framed homes awash in potted plants and airing laundry. “Tokyo seems to be this city of new buildings but in these valleys there are buildings that have been there since I was a child. I feel at home,” says Minagawa, who was born in 1963. So while the feudal lords built their villas high on the hills of the yamanote, ordinary people filled in the river valleys in between. It was a natural arrangement: the run-off from the rivers created ideal conditions for paddy farming. This explains why you can find pockets of what look like quintessential shitamachi — the two-story wooden houses and narrow shopping streets — on the yamanote side of town. We wind our way past a park, Wakaba-koen, one of Tokyo’s many sad, asphalt slabs with just a smattering of benches and a plastic slide. According to Minagawa, a park in Tokyo usually means one of two things. If it is a landscaped park with a pond (such as Arisugawa Park in Hiroo), it was likely once part of a feudal-era villa. (Ponds, it seems, were a must for any lord worthy of his preferential plot of land). If it’s paved, like this one, it was probably once a swamp. Eventually we reach that shōtengai. 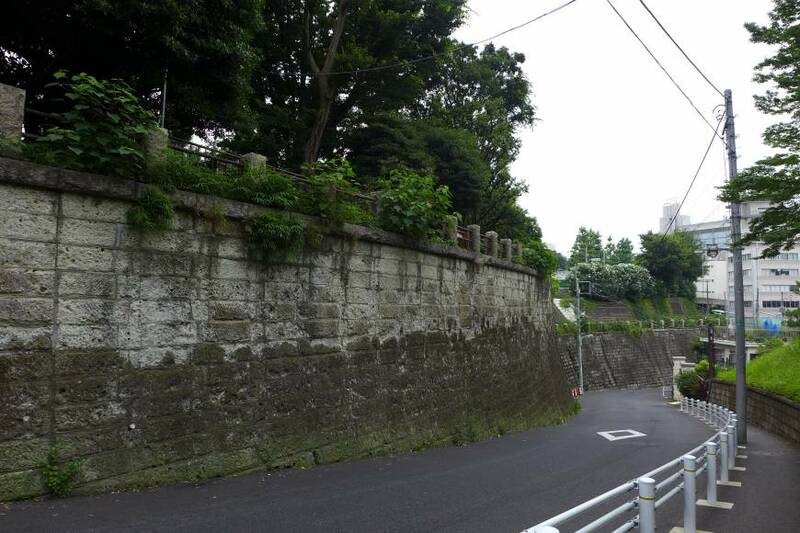 “This used to be a river,” Minagawa says, pointing to the street’s curiously meandering path. Or rather, it likely still is a river — one that now flows underground. During the heady days of postwar reconstruction leading up to the 1964 Tokyo Summer Olympics, many of the city’s waterways were diverted underground and their paths paved over. In 1960s Tokyo, there was nothing so romantic as progress. So this is what happened to the rivers, all but invisible unless you know what to look for: a winding street, faint echoes of running water under a storm drain and addresses that include kawa, the Japanese word for river. “If you imagine that the road you are walking on used to be a river, that’s kind of exciting, right?” Minagawa asks. Yet how many Tokyoites are aware of the rivers they cross every day? (A quick survey of friends suggests not so many.) The Wakaba shōtengai is but one example and many other shōtengai were also once rivers. Shibuya’s main drag, Center Gai, and Harajuku’s Cat Street are other examples. The rivers that run under each, the Uda River and the Shibuya River, converge under Shibuya’s famous scramble crossing. It makes sense when you think about it: whenever heavy rain falls on the capital, domestic TV stations send their camera crews to Shibuya for footage of taxis sloshing through flooded streets. What is perhaps most fascinating about this secret underground life of the city is that it still seems to be just that — a secret. And in just a generation or two, the collective memory of the city will be erased. What defining elements of Tokyo will be completely forgotten in 50 years? 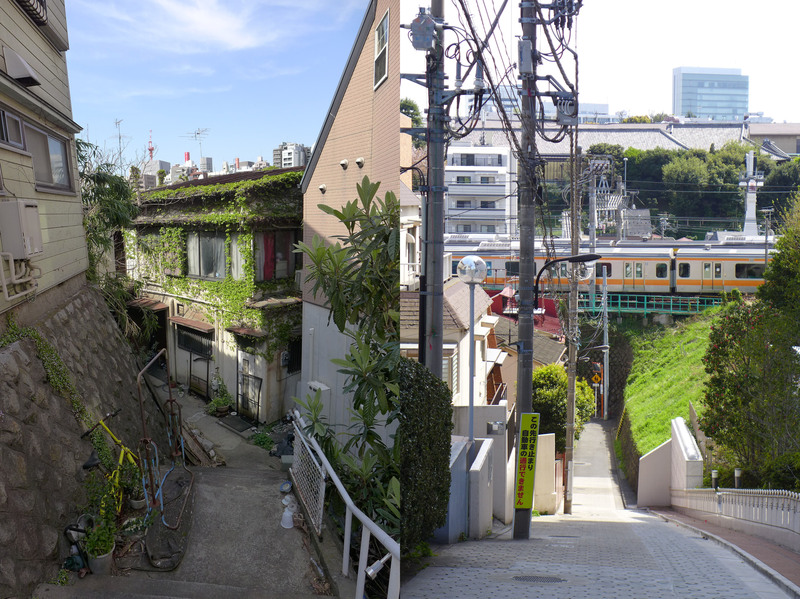 As much as Tokyo is a city of hills and valleys, it is also a city of progress and engineering. The poor Edo-era souls who dug the Kanda aqueduct, the deep gash that you see when you take the Chuo Line past Ochanomizu, may not have had bulldozers but they dug it just the same. And bulldozers eventually came anyway. So did concrete, which settled over the city like another layer of ash. Increasingly, it’s not just the rivers but whole valleys that are getting paved over: Roppongi Hills is the classic example of a “divot” that has recently been filled in. “From a land distribution point of view, it’s a waste to have these small houses in the middle of Tokyo. 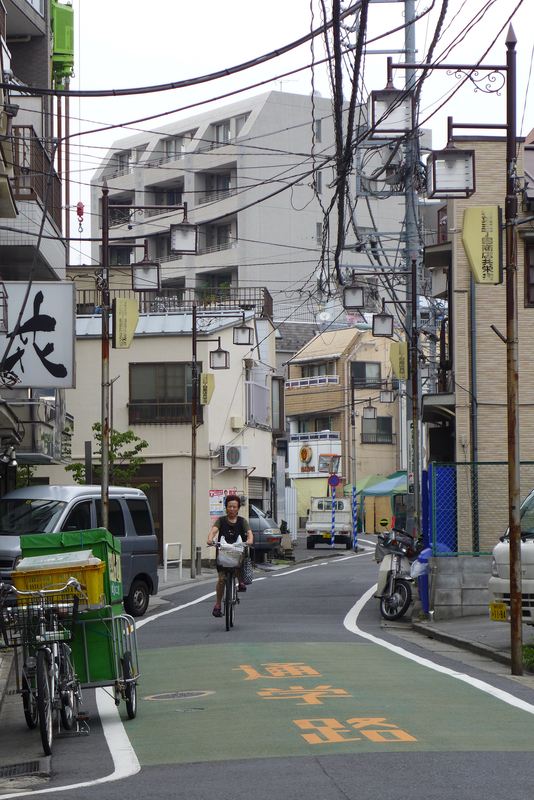 Minato Ward is the liveliest area in Tokyo, so it is naturally attractive to developers. In the place of a two-story building, you could put up a 10-story or 20-story one,” says Minagawa, who tries hard to be an objective observer, though he admits he doesn’t always succeed. “I hope at least some of these places with a real sense of Tokyo — a sense of history — will remain, and not become just more of the same developments that could be (located) anywhere,” he says. Some might even call it … romantic. Norihisa Minagawa will talk at Suribachi Night 2 on Saturday, July 26, at Tokyo Culture Culture inside Zepp Tokyo. For more information, visit tcc.nifty.com/cs/catalog/tcc_schedule/1.htm. His book, “Tokyo Suribachi Chikei Sanpo,” (Yosensha, ¥2200; in Japanese), with color photos and maps throughout, lays out 15 walking tours, including the one described in this article. If you’re curious where you stand — with the winners or the common folk, or even if you’re just interested in the history of your local park — there is a fantastic smartphone app, Tokyo Jisou Maps, that allows you to see your present location on maps from various time periods.